Travel magazine named Broad Reach in Waternish, Skye, as the tops for a “sunset-view stay”. Second in the six places named by Travel was Sri Panua in Phuket followed by properties in the Maldives, Brittany, Cornwall and Tuscany. From its elevated position in Waternish, the house has wrap-around views of the conservation fishing village of Stein, the picturesque waters of Lochbay and Loch Dunvegan and, across the Minch, to dramatic sunsets over the Outer Hebrides. Clive Hartwell, owner of Broad Reach, said, “Of course, Lydia and I built the house to take advantage of the amazing sunsets on Waternish shared by all who live and visit us here. Perhaps most astonishing is their variety across the year. 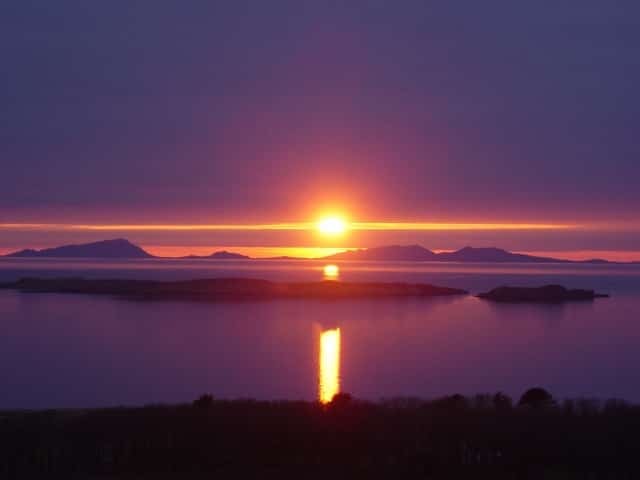 From the winter solstice when the sun drops behind the cliffs across Lochbay before swinging back through Dunvegan Head, and then the silhouetted Western Isles until six months later when it sinks behind the hills of Harris before returning through its 60 degree arc. Every house in Waternish will have a slightly different angle on the sunsets but we all share the range of stunning colours: from soft silvery opalescent watercolours to burning oranges, golds and even blood-red dramas bounced from clouds and across the mirrors of loch and Minch.